We are taking group painting to a whole new level! We now offer Wine Glass Painting – guests can choose the type of glass they would like to paint. Get a group of friends together to paint a custom wine or beer glass – everyone creates their own design! During these events, we bring along tons of examples of glasses we have created for guests to use as inspiration. We bring paints, brushes, aprons, and tons of special tools to make painting your glass that much easier! You would be amazed what you can paint with the tools we provide! Wine Glass Painting is the next step in home parties with friends or family! 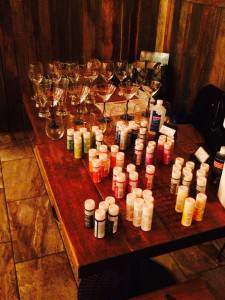 Wine Glass Paint Nights are $15/person in Rhode Island. Out of state events are $20/person. We know that most people spend their days dealing with stress from work, family, and the other million things that seem to pop up each day. It’s time to take a bit of time for yourself – to remind yourself that not everything in life has to be so serious! Spend an evening with us at a restaurant location we frequent, or have a party with friends in your own home. You and your friends will have a blast being creative together – and leaving with something you created yourself. We will be there to assist with questions on techniques and tips/tricks to make your glass look amazing! Think of the possibilities when you allow yourself to let go a bit – and have some fun! Let’s be serious – after a long day at work, some of us can agree that having a nice glass of wine is an excellent way to wind down. Imagine having that glass of wine in a glass that you painted yourself (or received from a friend as a gift). Who doesn’t love having a pretty set of wine glasses? Check out some of the glasses we have created and see what can be done with a little paint and lots of laughs! Book your event today, or check out our calendar and see where we will be creating glasses next! We can’t wait to help you plan the perfect event.